Welcome to another Feminist Friday column, our fave way to end the week by highlighting a collection of videos and trailers that we can’t get enough of. As always, we try to use this opportunity to showcase an expanding and intersectional definition of feminism, while having a central theme. This week it’s all about women breaking barriers and shattering glass ceilings. Women building opportunities and paving pathways that didn’t exist before. The first video is a trailer to a new documentary called ‘United Skates’, by filmmakers Dyana Winkler and Tina Brown, highlighting an underground subculture that has largely been forgotten by the mainstream. “When America’s last standing roller rinks are threatened with closure, a community of thousands battle in a racially charged environment to save an underground subculture– one that has remained undiscovered by the mainstream for generations, yet has given rise to some of the world’s greatest musical talent,” says the film’s description. The second video is another trailer for a documentary, this one called ’93Queen’ from director/producer Paula Eiselt. Set in the Hasidic enclave of Borough Park, Brooklyn, the film follows a group of tenacious Hasidic women who are smashing the patriarchy in their community by creating the first all-female volunteer ambulance corps in New York City. With unprecedented—and insider—access, ’93Queen’ offers up a unique portrayal of a group of religious women who are taking matters into their own hands to change their own community from within. The third video is a documentary called ‘Political Animals’, from filmmakers Jonah Markowitz and Tracy Wares. It follows the fascinating rise of the first four openly gay legislators in California: Carole Migden, Jackie Goldman, Sheila Kuehl, Christine Kehoe. Their personal struggle for LGBTQ civil rights takes them from protesting in the streets and into the halls of government. The film was originally released in 2016, the year that shall forever be marked as the tumultuous beginnings of our current political environment. 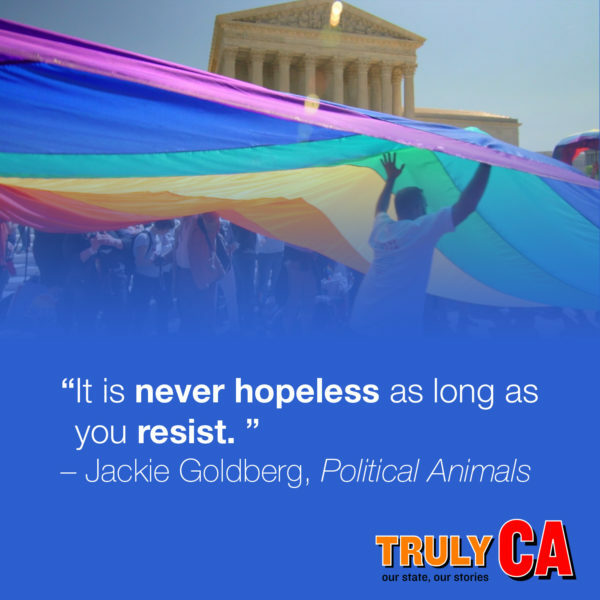 ‘Political Animals’ is a reminder that even in the midst of great opposition, there are champions among us, everyday heroes who will stand in the void and be a voice for many other marginalized groups. It becomes even more poignant knowing these 4 legislators rose up at a time when LGBTQ representation in politics wasn’t anything like it is in 2018. Fierce, determined, focused and passionate, these women had the courage and foresight to start the work of legal rights of the LGBT community, ultimately paving the way for other states across the nation. Bills they authored included the first domestic partnership registry enacted by a legislature, the first anti-bullying bill protecting gay students and many more. It was a hard fight – filled with surprisingly heated debates and hateful insults hurled by opponents. This film shows how their legislation brought about change in laws and societal acceptance, the strategies behind this incremental change, and what tough bargains had to be made to get us to where we are today. While legislators often follow the will of the people, these visionary women were brave pioneers in creating lasting and significant social change. Part of that change is celebrating the rise in the number of LGBTQ candidates running for office, and winning, as told by Victory Fund, an organization with a mission to get LGBTQ candidates elected to public office in races nationwide. “There are more LGBTQ candidates running than ever before this election cycle – and LGBTQ Victory Fund is on-track to endorse more candidates than at anytime in our 27-year history. The surge in LGBTQ people running for office can largely be attributed to a backlash against the federal government and many state legislatures targeting our community with harmful policies, as well as LGBTQ people seeing the electoral success of LGBTQ candidates in the last few cycles,” said Victory Fund director of communications Elliot Imse.